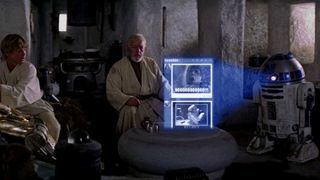 In some circles, the blogging site Tumblr can be a wretched hive of scum and villainy, eclipsed only by the Mos Eisley space station, but there's nothing like the arrival of a Jedi Knight or two to take out the trash. Yes, Star Wars now has an official Tumblr page, following an announcement on Twitter earlier today, promising "comics, clips and awesome Star Wars art." The page, which is part of Disney's big social push ahead of Star Wars: Episode VII, promises there'll be none on Tumblr's trademark cat videos, unless you count the odd nexu. Star Wars' arrival on the Tumblr follows the launch of an Instagram page earlier this month. What next? A Pinterest chronicling the Stormtrooper autumn/winter fashion guide?